For her Division III, Margo Dalal analyzes the effectiveness of urban enterprises and incubators in revitalizing a city. Margo: I first saw Detroit while I was participating in Co-Cycle, a student-led bicycle tour of cooperatives across the country, during the summer after my second year at Hampshire. Entering the city, it looked blighted and empty. The idea of an abandoned airport was crazy to me. But once we arrived we found some amazing examples of cooperatives. The contrast between a surreal cityscape and really progressive businesses made a big impact on me. I moved to Detroit in January 2014, where I was a resident in a program called Practice Space. It was created to help young professionals get involved in the community while helping people who wanted to start small businesses. 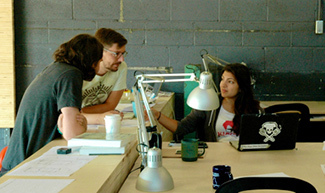 They set up in an old auto body shop that they had rehabbed into an architecture studio. The idea of newness was embodied in the space, since they were really trying to take advantage of the push for entrepreneurship and the adaptive reuse of space in Detroit. The residents met with the entrepreneurs four times a week to work on their business plans. We also had guest speakers with all sorts of people visiting the studio daily. I was very eager to learn about the revitalization of Detroit, and this was a great way to do that. It was an opportunity to work in Detroit while still absorbing and thinking critically like a student. Practice Space, though, closed after one year. As part of my thesis I critique Practice Space’s methods and explore it as an example of an enterprise, a business incubator, that could have been implemented better. In the other half I identify patterns of redevelopment in Detroit in the 1950s and 1980s, and analyze the role entrepreneurship plays in the current era of redevelopment. This is a relevant topic. My research explores how these redevelopment patterns are repeated and affect Detroit residents. Historic racial and social tensions must not be separated from the current state of the city, and this isn’t always recognized in current redevelopment plans. My main finding was that entrepreneurship is currently a primary strategy for economic redevelopment in Detroit. However, entrepreneurship-led urban revitalization is not new. The approach was coined in the late-80s, and in Detroit this approach has had plenty of manifestations at different levels. It is hard to keep up with redevelopment initiatives in Detroit and with the numerous enterprises that seem to pop-up weekly. However, while there is a lot media about the positive aspects of revitalization and growth, issues that many residents face continue to go unrecognized and unaddressed. Leaving Detroit after eight months to return to Hampshire was extremely hard. I developed a pride for the city and respect for the people I met and worked with there—and from listening to the stories of the people who call Detroit home. I plan to return soon and continue my research in exploring the role that architects and urban planners, in additions to entrepreneurs, play in Detroit’s revitalization. Myrna Breitbart: Gabriel and I have encouraged Margo to take her Division III and hone it down to an article for publication in a planning or architectural journal, or maybe someplace that will reach a lot of her own generation interested in the impact of urban entrepreneurship and its ability to improve the lives and life prospects not just for newcomers to the city, but for residents still suffering the effects of deindustrialization and racial injustice. She asked a lot of questions that are really provocative, and if she does return to Detroit she'll go back with the ability to examine what's happening with a critical eye, while looking for those best practices that she didn't find at Practice Space. Photo of Mexican muralist Diego Rivera's Detroit Industry fresco at the Detroit Institute of Art by Kathy Zarur.